MatadorU student Sarah Shaw heads to Korea’s DMZ to launch socks across the border. ON SATURDAY, JUNE 30TH, I left my apartment at 8AM wearing rain boots and a camera slung around my neck. 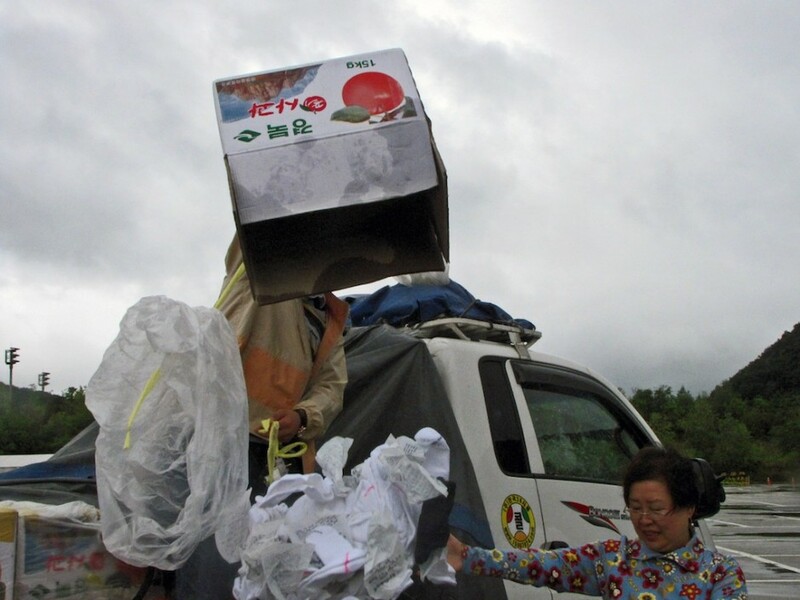 I was heading to Paju, a South Korean city located 10km from North Korea, bordering the western side of the demilitarized zone, to meet members of the nonprofit North Korea Peace and participate in a balloon launch that would send socks to North Korea. Socks are a precious commodity in the North, where the economy has completely collapsed and approximately 100,000 children are said to starve each year. One pair of high-quality socks can be exchanged for 10kg of corn in one of the illegal black markets scattered around the isolated, communist state. This is enough to feed one adult for a month. Additionally, lack of socks and proper footwear leads to thousands of North Koreans injuring their feet — many wind up with amputated legs, and since the state lacks sufficient medical resources, they have no access to prosthetics. North Korea Peace began launching balloons last November. The balloons are 10m long and filled with hydrogen. 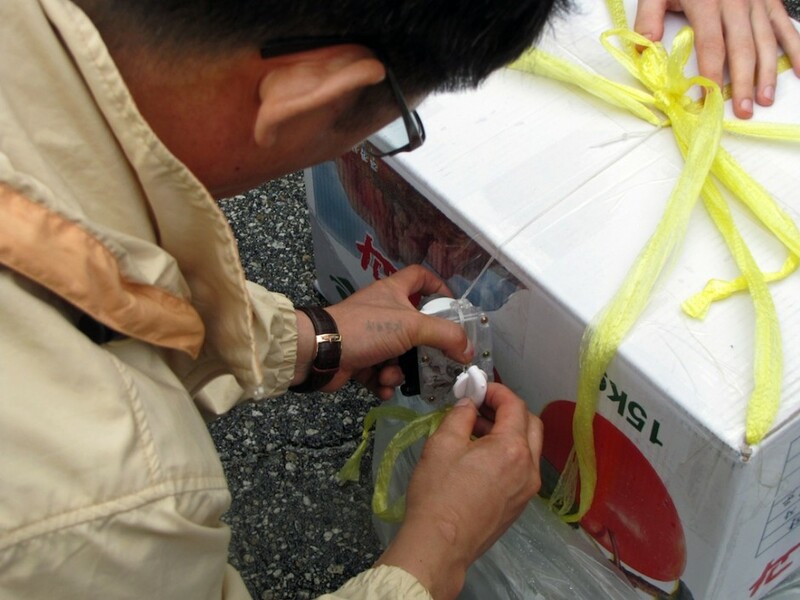 Boxes of socks are attached to the balloons, and they can float as far as Pyeongyang. 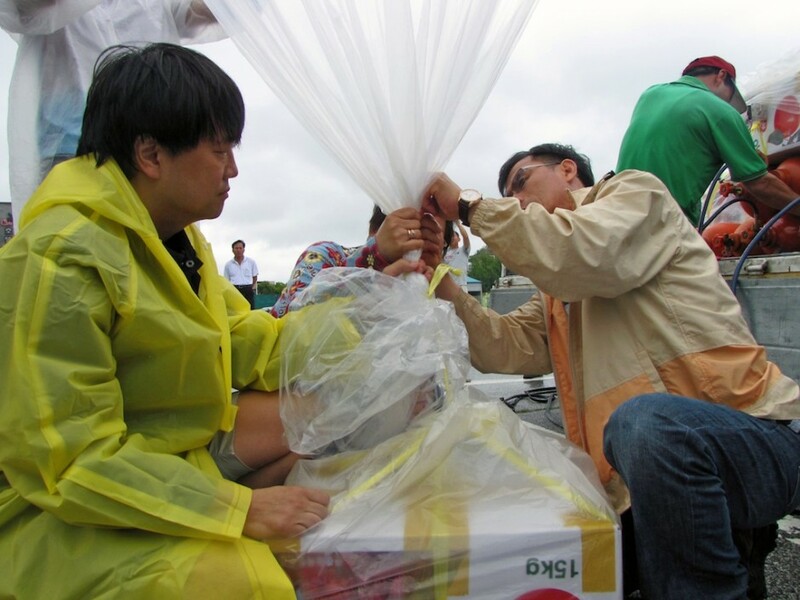 The balloon launches are run by Mr. Lee, a North Korean defector, along with two South Koreans, Sunnie and Peter, who have lived abroad for a substantial part of their lives. A number of regular volunteers have attended every launch. 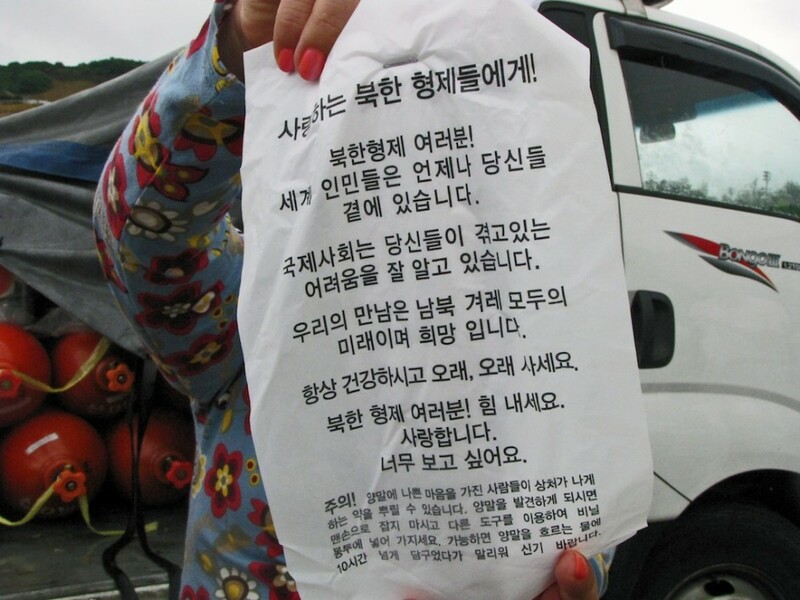 In 2003, Mr. Lee found an informational leaflet from a South Korean balloon launch, which became his inspiration to defect three years later, at 40 years old. It also inspired him to lead these launches today. After the launch, Mr. Lee shared his story with us over lunch in a traditional Korean restaurant. In North Korea, he worked in the trading business, constantly traveling between North Korea and China. Even though his father had criticized Kim Il Sung’s regime, Mr. Lee proposed an idea to create a business to bring food into North Korea. Because North Korea was facing a famine at this time in the ‘90s, the government gave him a chance to see if he could achieve what he strategized. He succeeded. When he found the leaflet from a balloon launch, he didn’t know whether its anti-regime message was true. Then, on a trip to China, he was able to talk to his Chinese friends about it and watch South Korean news. He soon realized the North Korean government had been lying to him. After Mr. Lee’s best friend escaped, he decided to flee North Korea as well. He planned his journey carefully. After arriving in China and later South Korea, his wife sold their house in the North and hid with their children to avoid being sent to a labor camp or being sentenced to death. Mr. Lee was able to borrow money from new companions in South Korea to arrange for his wife, children, and 80-year-old mother to escape safely. His friends in China helped them. Each launch costs approximately $2,000, and North Korea Peace is constantly seeking sponsors to keep these launches running each month. In South Korea, Mr. Lee has worked a variety of odd jobs — construction, washing dishes and windows, delivering flowers and mail. He faces discrimination regularly in the South, even though he’s largely acclimated to his new home. Yet, despite Mr. Lee’s tragic past and struggles to blend into South Korean society, he lives with a positive attitude. He devotes a substantial amount of time and energy to run these balloon launches once a month to give hope to his countrymen in the North. Because North Korea has set social classes, consisting of executive, middle-class, to-be-watched, and to-be-executed, delivering socks by balloon is the only possible way that resources may reach citizens on the bottom rung of the social ladder. To participate in a balloon launch with North Korea Peace, join the Facebook group and look out for events taking place on the last Saturday of the month. You must pay 20,000 won ($18) to join a launch — this includes a round-trip bus ride from Seoul to Paju and a donation to the cause. If you’re unable to join, but would like to donate, visit their webpage. Each launch costs approximately $2,000, and North Korea Peace is constantly seeking sponsors to keep these launches running each month. Although it was raining in the morning, the wind speed and direction were perfect for sending balloons to North Korea. 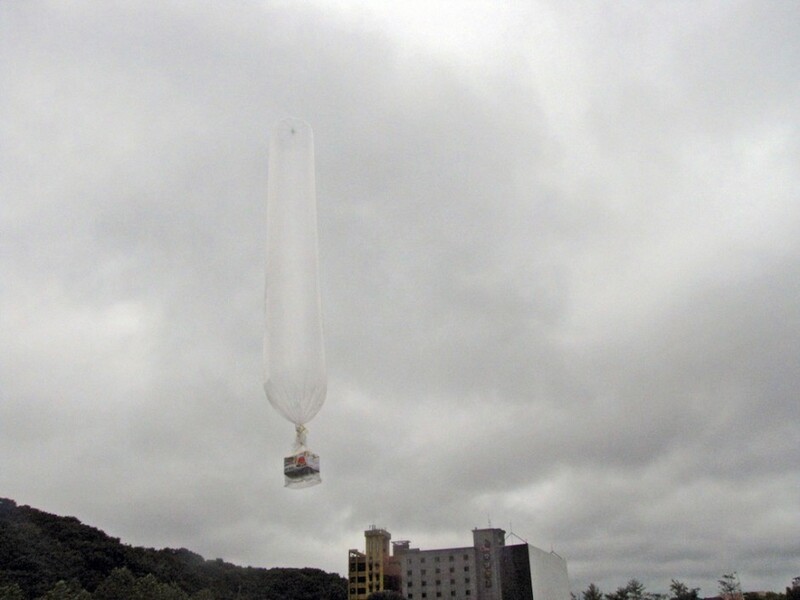 Seven were launched, each 10m long and filled with hydrogen. Mr. Lee demonstrates how the socks will arrive in North Korea. 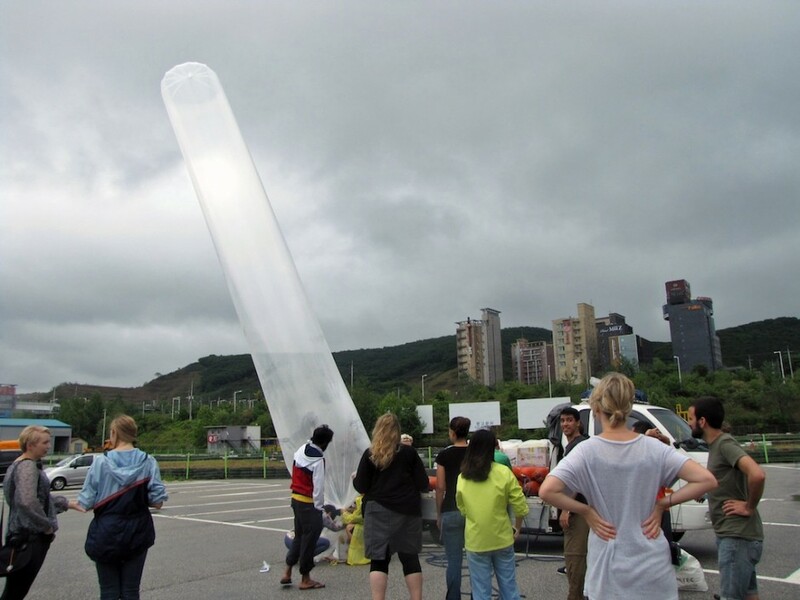 Each balloon is attached to a timer, allowing it to travel as far as Pyeongyang. When the timer stops, a string breaks, and the socks shower down. Sunnie, one of the head volunteers, holds up a pair of socks. They're top quality, costing five times as much as the socks that China sells to North Korea. On this day, we sent 2,000 socks into the North, equivalent to 20 tons of corn. 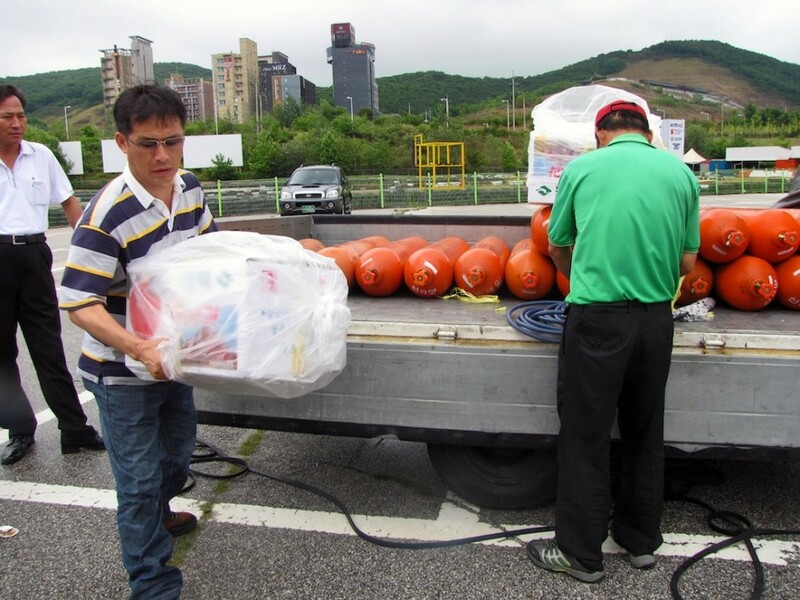 Several organizations used to send food to North Korea via balloons, but many times the government would intercept and poison it. When common citizens found the food and ate it, sores would develop in their mouths along with other health issues. 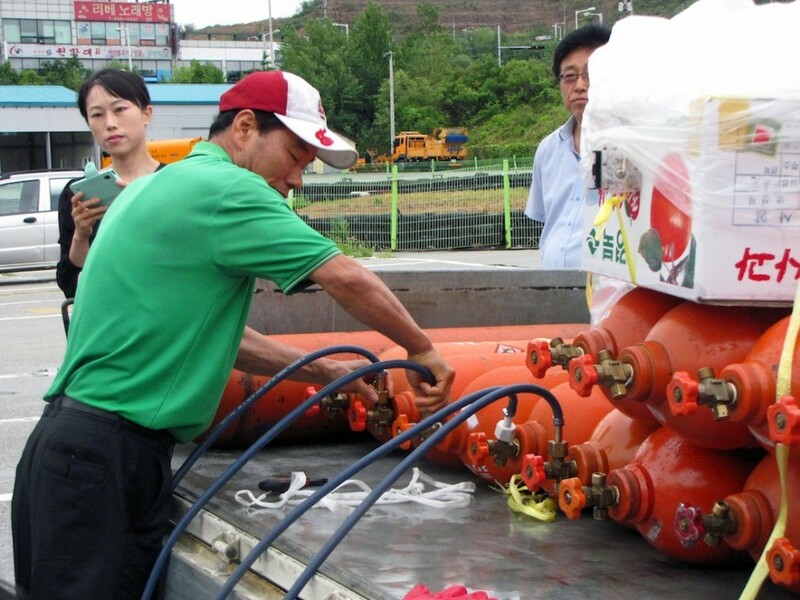 The North Korean government convinced them that South Korea purposely poisoned them. Because of this, North Korea Peace solely sends socks. Instead of criticizing North Korea, Mr. Lee prefers to attach a message of hope to each pair of socks, saying: "Our dear siblings in North Korea! Hello North Korean siblings! 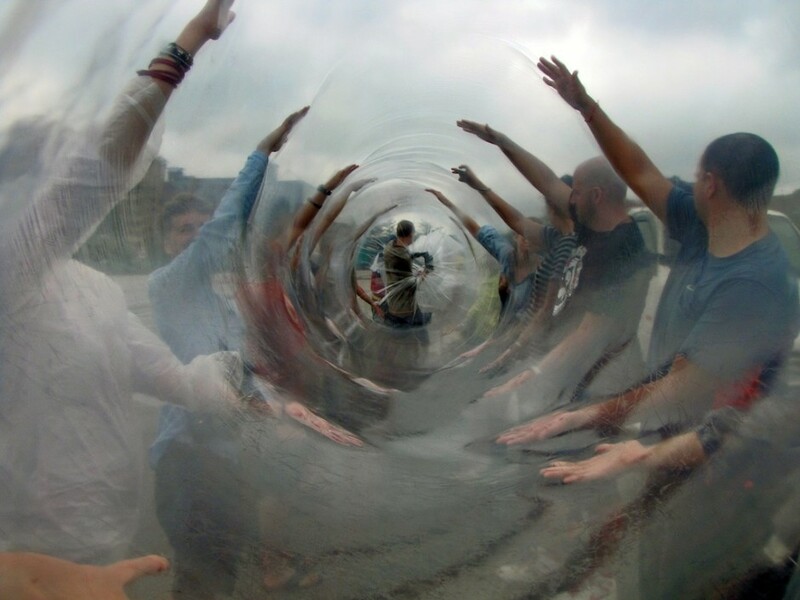 Around the world, people are always with you. Your difficulties are well-known internationally. We hope North and South Korean people will reunite in the near future. Please live a long and healthy life! Stay strong. We love you. We miss you so much. Warning! It is possible that some bad people may have sprayed these socks with poison that could harm you. If you find the socks, do not touch them with your bare hands. Pick them up with tools and store them in plastic bags. If possible, rinse these socks under running water for at least 10 hours before wearing." A volunteer connects cans of hydrogen to the balloons. 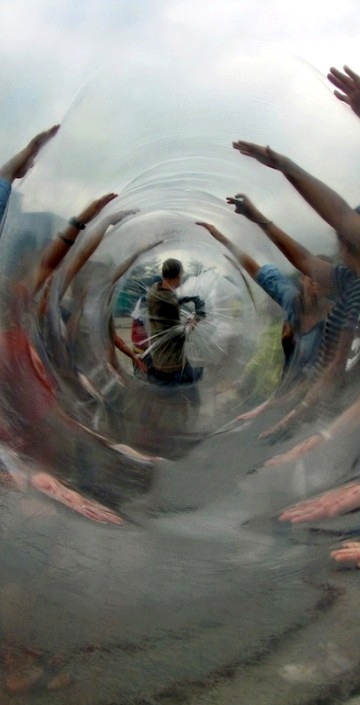 Since helium is so expensive in South Korea, hydrogen is used to inflate the balloons instead. Mr. Lee attaches a timer to one box of socks. I noticed the tattoo on his left hand and asked him about it. It translates to "good health, music, virtue, wisdom." This is the life philosophy he's been writing on his hand since he was ten years old. Despite Mr. Lee's tragic past, he has a positive attitude. Instead of dwelling on his past misfortunes, he devotes his time to helping fellow North Koreans survive and find inspiration through the message attached to the socks. Mr. Lee carries the next box over, while another volunteer begins to connect the hydrogen to the next balloon. Mr. Lee (right), Sunnie (middle, behind the balloon), and Peter (left), the three main volunteers, connect one of the balloons to a box of socks. 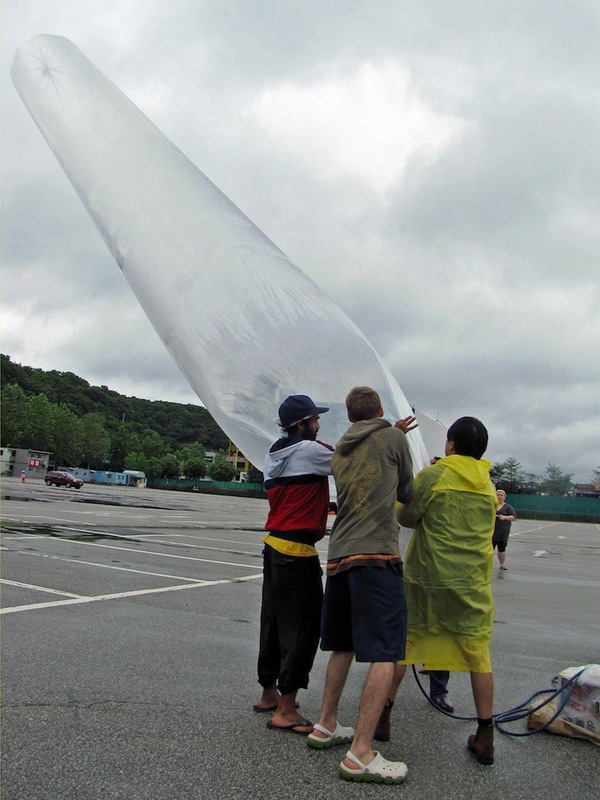 Volunteers from eight different countries hold the balloon as it inflates. 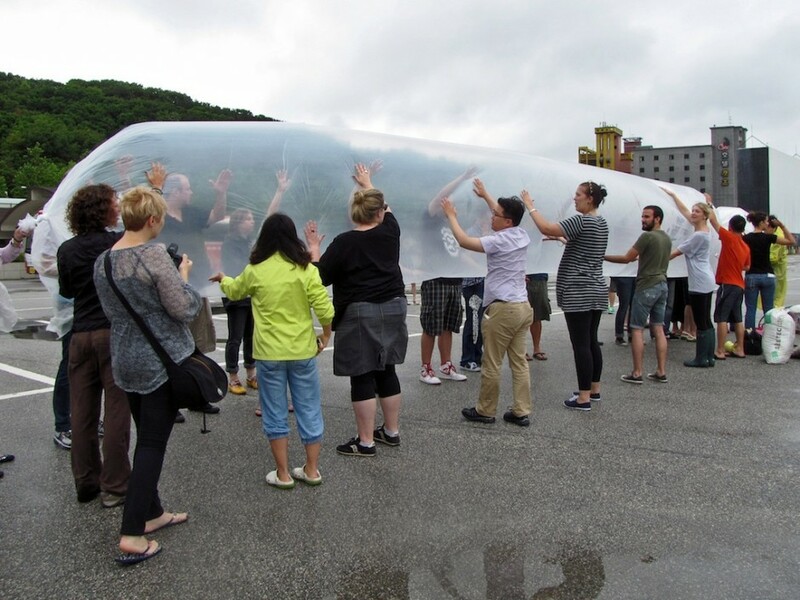 The volunteers either hold the balloon with their palms, or wrap their arms around the fragile material, to prevent the balloon from rupturing during inflation. Volunteers prepare to launch the balloon. One balloon floats towards North Korea! The balloons can fly for quite a long time, sometimes reaching as far as Pyeongyang. We hope these socks land in the right hands, and prevent at least one person from getting gangrene or dying of starvation.